The second hidden lot in The Sims 4 is the Forgotten Grotto which can be found in Oasis Springs. 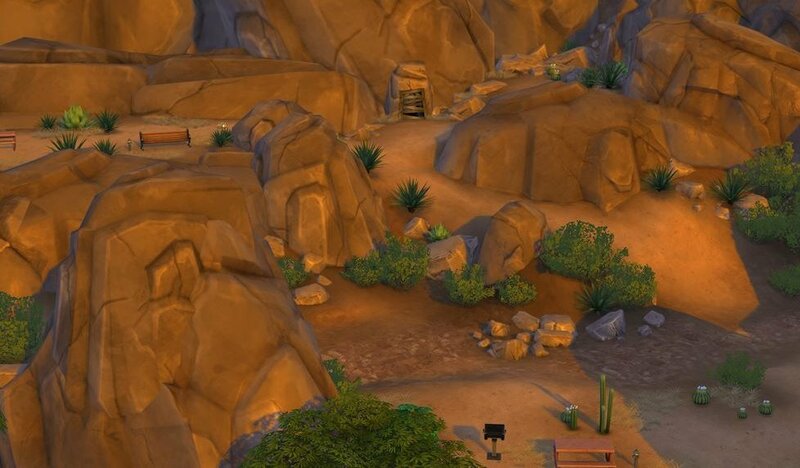 And since we’ve already shared with you how to unlock the Sylvan Glade in the game, we will also tell you how to get access to the nice Forgotten Grotto in Oasis Springs as well. Get to Level 10 Handiness (read three books) before starting this adventure! Then, you have to go to the Desert Bloom park in Oasis Springs. Once you get there, travel away from the park towards the mountains. There’s a bit of walking that you have to do: first, you will get to a Bathroom inside the mountain, then go to the left of it until you find an abandoned cave entrance. Now you have to interact with the Mine Cave. Since you have level 10 Handiness, you can interact with the door and blast it away. After the door is away, select “Explore” to start your adventure towards the Forgotten Grotto. You need to select the right answers, and these are: Take the Wide Path, Climb the Ladder, Step onto the Ledge, Travel to Grotto, OK.
Now you have access to this beautiful area and a ton of great collectables are waiting for you. Don’t forget to fish as well! Have you unlocked the Forgotten Grotto in The Sims 4? What do you think about it?